AWE Tuning Turbo - 1.8T K04 Kit - Dezod Motorsports Inc - Home of the automotive performance enthusiast since 2002. The AWE Tuning K04 Kit for the 1.8L Turbo set a standard for K04 upgrades. Dyno developed, track tested, and hundreds of hours of tuning and field usage brings us to the finest example of B5 daily driving power delivery. Easy, bolt on install, factory appearance, reliability and AWE Tuning customer service. All part of the package. 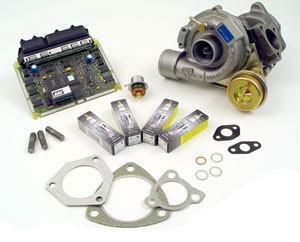 The AWE Tuning K04 kit for the 1.8T consists of the Borg Warner K04 turbo, AWE Tuning/G.I.A.C. software, a performance Fuel Pressure Regulator, all gaskets, and hardware required for installation and a Bosch spark plug set. This kit utilizes the larger K04 015 turbo, with our specially designed G.I.A.C. software, to good effect. This AWE Tuning exclusive transforms your 1.8T into a lightning fast, yet factory-reliable, rocket ship. The addition of specially designed and tested PC16 software ups the power, and ups the torque for those looking for…. More. This kit also contains the Borg Warner K04 015 turbo, a performance Fuel Pressure Regulator, all gaskets and hardware required for installation, and a Bosch spark plug set. In addition, this edition of the AWE Tuning kit incorporates PC16 specific Software, as well as PC16 specific Fuel Injectors. The PC16 Upgrade package adds ~30 more ftlbs torque and ~12 more horsepower. This upgrade is for those who have already purchased the AWE Tuning K04 Turbocharger Kit with G.I.A.C. Software, and are ready to take it to the next level. Importantly, this upgrade is only for those who have already purchased the G.I.A.C. software which comes with the AWE Tuning K04 Turbocharger Kit. This upgrade includes your G.I.A.C. PC16 Software Upgrade, Fuel Injectors and Fuel Pressure Regulator, to allow for the additional power. For 97-99.5 owners, you will need a Front Mounted Intercooler to run this upgrade, and if Tiptronic is your transmission of choice, you will also want to update your transmission software with a Tip Chip. The key to the power improvements is the combination of heavily engineered AWE Tuning hardware coupled with industry leading software from G.I.A.C. Many hours were spent studying the complex programming of the Motronic fuel injection found on these vehicles, and determining how to integrate all the essential maps for repeatable, predictable power improvements. Final tuning of the fuel mixture, ignition timing advance, boost level, and monitoring of the associated Exhaust Gas Temperatures were completed on the AWE Mustang load-type dyno, to ensure safe, consistent and meaningful performance in the real world. The software of each kit is tailored to the specific requirements of the vehicles, so that a minimum of part replacements is needed to fit the larger K04 turbo. The stock intercooler, piping and fuel injectors are retained, keeping the final price of the kits and associated install labor affordable by all. Outward appearances are totally stock OEM. Please note that a full flow exhaust system from the catalytic converter back is required for use with this turbo. Dyno results and driving impressions reveal an extremely broad powerband, with usable torque as low as 2000 rpms, and hard pulling horsepower as high as 6700 rpms.